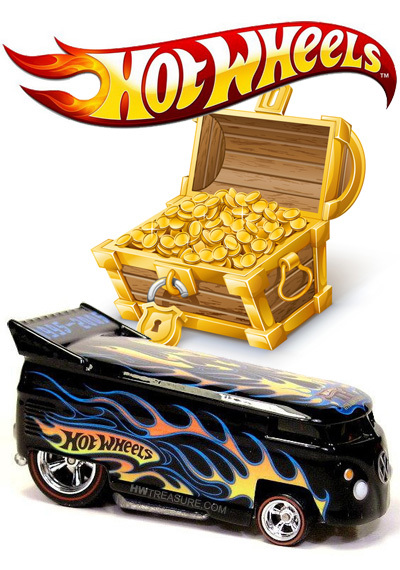 In 1995, Mattel released a new series of Hot Wheels called Treasure Hunts. They were randomly packed into cases with only 10,000 of each vehicle produced. Being extremely popular with collectors, the 1996 set was increased to 25,000 of each vehicle. Subsequent years haven’t revealed the quantity produced, but the cars remain difficult to find. They can be identified by the card packaging which has a green bar and can say “Treasure Hunt” or “T-Hunt”. Each set consisted of 12 cars until 2005 when the VW Bus was used as a bonus 13th vehicle. Following years remained at 12 until 2011 when the series was increased to 15. In 2007, Super Treasure Hunts were introduced creating two sets. A Super is an upgraded version of a vehicle with Spectraflame paint, Real Rider wheels, and a much smaller production run. The easiest way to identify a Super is by the card. It replaces the “S” with a dollar symbol and can look like “Trea$ure Hunt$” or “T-Hunt$”. 2012 revealed Super Secret Treasure Hunts and unlike previous years they are not upgrades of the regular versions. Each vehicle in the set is part of a different series like “HW Racing” or “Muscle Mania”. They do not have the green bar on the card and discovering one may prove difficult. There may be a “TH” or “Treasure Hunt” graphic on the car, or nothing but Real Rider tires and Spectraflame paint to identify it. 2013 brought an end to the green bar on the packaging making all Treasure Hunts harder to locate. Every vehicle is part of a different series and to identify one of these hidden gems you have to find the low production symbol, a circle with a flame, on the car.